"The AlcAlert fits great in my purse and delivers accurate results without any hassle. I test everyone before letting them get behind the wheel." "So simple to use, you just blow over the AlcAlert and it gets me the results quickly and painlessly. I recommend the AlcAlert to anyone looking for a quality breathalyzer!" AlcAlert BT5500 is a very compact and effective screening device that responsible drinkers can't afford being without. Don't guess, verify if yourself or that someone is in a safe mental condition to drive or operate machinery. Why leave safety to chance? Let AlcAlert breathalyzer keep you alert, even if you had one too many. Compact and highly accurate semiconductor based technology comes to help responsible drinkers to stay ahead of any accident - while driving or operating heavy machinery. With AlcAlert you can make a more informed decision as to your mental condition with respect to safety and the law. 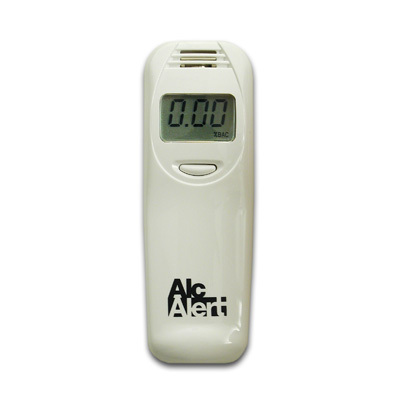 AlcAlert BT5500 is a reliable safety device that measures blood alcohol concentration (%BAC). Simply exhale into the unit and within seconds the LCD displays a precise measurement of your BAC. Smart industrial design has eliminated the need for installing mouthpieces. Unlike other breathalyzers the AlcAlert BT5500 does not require mouthpieces to maintain test sanitary conditions. The subject will blow at the device intake and never touches the unit by lips. This method makes the AlcAlert BT5500 an ideal alcohol tester for parties and public gatherings. It eliminates any health hazard associated with public testing and reward you with excess fixed cost of every test altogether. The BT5500 is truly the best personal breathalyzer in the market today. AlcAlert BT5500 is incredibly easy to use. Beeps when ready and again when enough sample is taken. Exhale gently into the unit and stop when you hear the second beep. In seconds, an easy to read back-lighted LCD will display the results in 0.01% increments. Display: %BAC in 0.01 increments ranging from 0.00 to 0.12 Notes: * Accuracy varies depending on individual metabolism, blowing conditions, humidity, and the condition of the sensor.